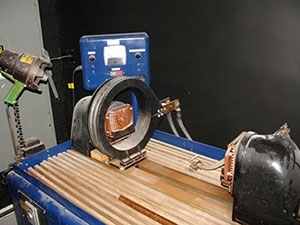 Magnetic particle examination (MT) is a very popular, low-cost method to perform nondestructive examination (NDE) of ferromagnetic material. Ferromagnetic is defined in ASME Section V as “a term applied to materials that can be magnetized or strongly attracted by a magnetic field.” MT is an NDE method that checks for surface discontinuities but can also reveal discontinuities slightly below the surface. But when a crack or other discontinuity is present, the magnetic flux leaks out of the material. 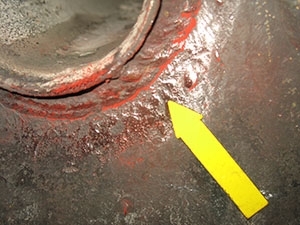 As it leaks, magnetic flux (magnetic field) will collect ferromagnetic particles (iron powder), making the size and shape of the discontinuity easily visible. However, the magnetic flux will only leak out of the material if the discontinuity is generally perpendicular to its flow. If the discontinuity, such as a crack, is parallel to the lines of magnetic flux, there will be no leakage and therefore no indication observed. To resolve this issue, each area needs to be examined twice. The second examination needs to be perpendicular to the first so discontinuities in any direction are detected. 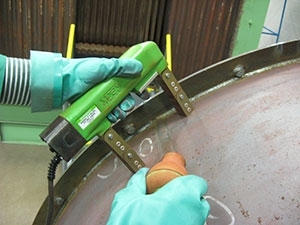 The examiner must ensure that enough overlap of areas of magnetic flux is maintained throughout the examination process so discontinuities are not missed. In the early 1920s, William Hoke noticed metallic grindings from hard steel parts (held by a magnetic chuck while being ground) formed patterns that followed the cracks in the surface of parts he was machining. He also found that by applying fine ferromagnetic powder to the parts, there was a build-up of powder at the discontinuities which formed a more visible indication. There are two different ferromagnetic examination media: dry particles and wet particles. Both forms can be either fluorescent or non-fluorescent (visible, color contrast) and come in a variety of colors to contrast with the tested material. tudinal and circular magnetization using wet fluorescent particles. Stationary systems are generally used for smaller parts such as crank shafts and valve stems. 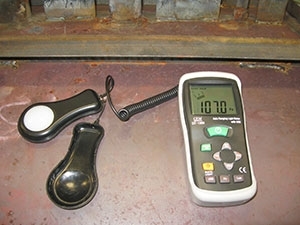 They are often found indoors around machine shops and heat-treating facilities. Typically they have a headstock and tailstock. Parts can be clamped between stocks for magnetization. There is also a coil placed around the part to magnetize it in the perpendicular direction. Stationary horizontal systems use the wet particle technique with a circulation tank below the equipment. Wet particles flow over the examined part and drain into the circulation tank. Wet particles have more mobility flowing in a liquid than dry particles. This mobility helps sensitivity by allowing particles to easily move to the discontinuities. Fluorescent particles are commonly used with stationary horizontal systems because indoor operation makes it easy to darken the area; required ultraviolet (black) light can then be used to evaluate the parts. Both wet method examinations have about the same sensitivity, but under correct lighting conditions, fluorescent indications are much easier to see. This type of stationary system can cost $15,000 or more. 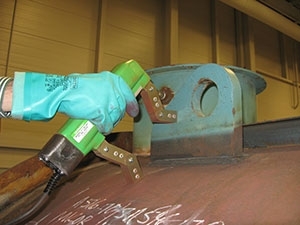 magnetic particle examination using an AC yoke with dry powder. The MT yoke technique is the most portable and lowest-cost method, and therefore the most popular method. A typical yoke kit would cost around $750. Most yokes can operate in alternating current (AC) or direct current (DC) modes. DC gives the most penetration and is recommended if subsurface discontinuities need to be detected. AC is recommended if the surface is rough, because AC gives the particles more mobility than DC. A yoke has an electric coil in the unit creating a longitudinal magnetic field that transfers through the legs to the examined part. The yoke technique is easy to use with minimal training. It can be used indoors, outdoors, inside vessels and tanks, and in all positions. Prior to use, the magnetizing power of electromagnetic yoke shall have been checked within the past year. An AC yoke must have a lifting power of at least 10 lb and a DC yoke of at least 40 lb. The following illustrate basic steps to use with the dry powder, non-fluorescent, yoke technique. Prior to the start of examination, all equipment and meters shall be calibrated in accordance with ASME Section V, Article 7. ASME Section V, Article 7 requires the magnetic particle visible method (color contrast) be evaluated with a minimum light intensity of 100 footcandles on the part surface. The proper quantity of light must be verified using some type of calibrated light meter and witnessed and accepted by the inspector. If fluorescent magnetic particles are being used, a black light shall achieve a minimum of 1,000 microwatts per square centimeter on the examined surface. If alternate wavelength light sources are used to provide ultraviolet light, causing fluorescence in the particles, it shall be qualified in accordance with ASME Section V, Article 7, Appendix IV. Light meter showing 107.0 footcandles of light. MT examination of the longitudinal seam on an inservice boiler. 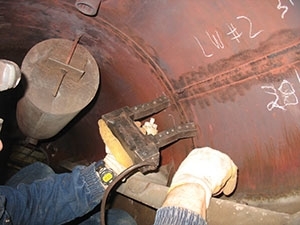 MT examination of a lifting lug weld on an inservice boiler. MT. This was the result of improper repair procedures. 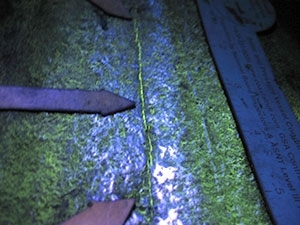 Wet fluorescent MT process showing a crack in a steam drum circumferential weld seam. Can detect both surface and near-surface indications. Surface preparation is not as critical compared to other NDE methods. Most surface contaminants will not hinder detection of a discontinuity. A relatively fast method of examination. Indications are visible directly on the surface. Low-cost compared to many other NDE methods. A portable NDE method, especially when used with battery-powered yoke equipment. A relatively safe technique; materials generally not combustible or hazardous. Indications can show relative size and shape of the discontinuity. Easy to use and requires minimal amount of training. Non-ferrous materials, such as aluminum, magnesium, or most stainless steels, cannot be inspected. Examination of large parts may require use of equipment with special power requirements. 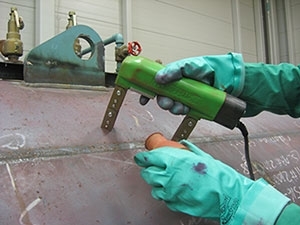 May require removal of coating or plating to achieve desired sensitivity. Limited subsurface discontinuity detection capabilities. Alignment between magnetic flux and indications is important. Each part needs to be examined in two different directions. Only small sections or small parts can be examined at one time. 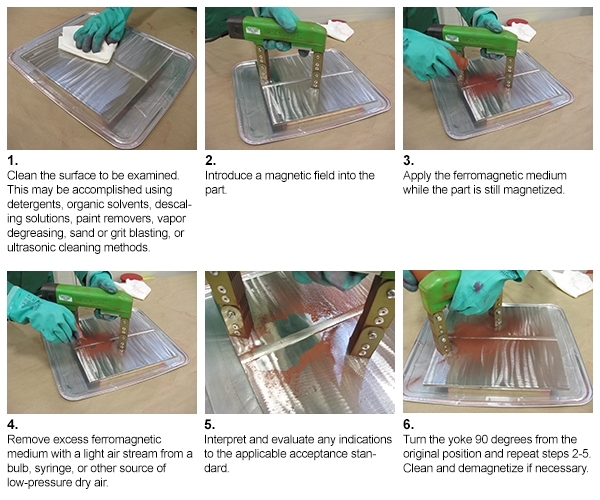 In conclusion, magnetic particle examination can be a useful nondestructive examination method during new construction and inservice inspections. It can only be used on ferromagnetic materials; therefore, it is not the best method for all applications. For quick, low-cost inspections, MT is often the best NDE method for detecting surface and slightly subsurface discontinuities.